Please have a member of each group post a link to your public-facing site(s) in the comments below, both so that we all have quick access to them as more journals and updates come in, and so I can offer some content/user experience feedback in the coming weeks. This week in Freedom Dreaming: A Call to Imagine we’ve made exciting progress on our outreach efforts. Raven has been an excellent asset in aiding with our Instagram presence and our account has already reached 74 followers! We’re hoping to hit 100 followers before next class. If you haven’t already followed our account(s) please do (and tell all your friends!). Based on this data, we’ve been primarily using the website and Instagram as our primary spaces for the project, though we do maintain a Twitter account and Facebook page as well. All groups members have been reaching out to recruit people for submissions (yay teamwork!) and we’ve already received 14 on the website! They are awesome, so you should definitely head over to our website https://bit.ly/freedomdreaming to check them out. We are still interested in submissions so please submit! It would help us out greatly if people from the class could get involved with our project. If you aren’t comfortable submitting publicly, our website allows for anonymous submissions. Feel free to only use your first name or a random name to keep your freedom dream anonymous. More information on ways to submit are in this update blog post we previously wrote. Ultimately, we are looking for submissions that critically engage with systemic oppression on the individual level and highlight that oppression to help address inequality. While we can’t control the submissions we receive, we are hoping that people engage with this project in the way that we’ve described and avoid general submissions like “I imagine freedom as joy”. A big thank you to Sandy from the Immigrant Newspapers project on being the first class member outside of the group to submit a freedom dream! We appreciate it! Overall, we are making excellent progress with the Freedom Dreaming project and are on track for our showcase presentation. This week in Immigrant Newspapers, we have been fine-tuning our public-facing website as we continue to build all of the profile pages of our newspapers. We have made the decision to add another page to our site to independently house the interactive map. Originally, we thought it would be possible to house the map within the header of our homepage, making it the dominant element of our site. After finishing the coding for the map and realizing that it is bigger and more intricate than we originally thought, we decided that it deserved the space and dedication of its own page. 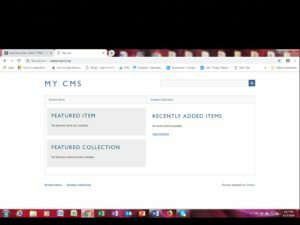 This allows the user to understand more readily that there is more content on the homepage as they scroll down, and it also more concretely sets up the four ways in which to use our database. Many advancements were made for the website this week, including font programming and a refinement of the tooltip boxes on our map. Slider background images were chosen for the site and are currently being uploaded. The footer of the site has been equipped with an Instagram plugin, recent post listings, and a search bar. The sidebar of the site is currently being debugged. We have been encountering an issue with our FAQ drop-down/accordion when viewed on mobile devices, which we are currently troubleshooting. Our plan is to attempt to finish our current work notes by the weekend and to reconvene on Tuesday. At that point we will send the site to test users and have one week to make final adjustments. Priorities for group members this week include: Antonios on logo and advanced website issues, Sandy on site copy and profile pages, Jen on map tweaking and profile pages, and Luci on website aesthetics and launch presentation preparation (though we are all doing many more things as we work together in our final push). This week, The RAAD Project has been striving to bring the database to fruition. We’re also fleshing out our Commons site, which will house our online “white paper” and a direct link to the Omeka database (we hope). Our logo must be re-created in Camilla’s absence by Carolyn and is forthcoming. May 7th: we will do a formal dress rehearsal. Full presentations due, including slides. We may have Lisa back for additional feedback if she is available. The showcase is on May 14th during class time. Provide a detailed articulation of what are the project contributes to the given field. What critical intervention does project offer? Place it in context with references to articles and sources to situate your research within crucial conversations in the field. Audience: Discuss in detail your audience and what they will learn/be able to do differently by engaging with your project. In particular, revisit your Work Plan and address how well it reflects the development and completion of the project. Evaluation: If you had the project evaluated, describe responses and feedback you received, and how you accounted (or plan to account) for these responses. Assess the weaknesses and strengths of the project. How were problems addressed? What could have been done differently? Future of the Project/Sustainability: what plans do you have for maintaining and expand the project moving forward? What are some foreseen challenges? Each person will also submit a personal final report (3-5 pages) that details their contributions to the project and how the experience of working on it fits into the arc of their professional development. Carolyn has taken charge of creating the “look and feel” for our public-facing sites, which include our site on the CUNY Academic Commons, and our Twitter and Instagram accounts, and is acting as the administrator and ‘editor’ for our content, ensuring that we have “one voice” and consistency across all touchpoints. She’s also putting the finishing touches on our SWAG. 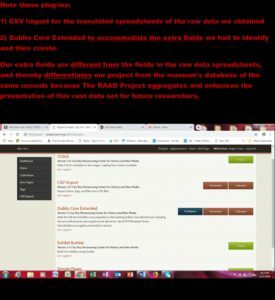 Patty has completed mapping the Omeka data fields to our dataset, with Field Titles that will appear on The RAAD Project’s omeka site, with an attempt to conform to the Dublin Core Metadata standard. 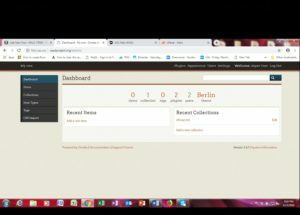 In addition to using the fields that we received from the museum, we were able to create additional fields that provide more information about each artifact. (For example, embedded in the item number is the date when the artifact was first catalogued, which roughly conforms to the date that the item was acquired. By culling this date, we were able to add a new field to each item entitled ‘date catalogued’.) We’ve also cleaned our beta dataset of 50 records, which are ready to be converted to a csv file and loaded on to Omeka. Pam had a eureka! moment last week and figured out how to do the ‘hard coding’ required to customize the field names for our data. Stephen Klein provided the expertise that we needed to add additional fields to Omeka with a special PlugIn (we would never have found this without his help – thank you Stephen!) and generously offered to do the hard-coding. Pam thought she could figure this out based on his notes, and had her breakthrough last week! Once this is done, then she will load the data with the csv file input and then format our site. Camilla had to return home to Norway unexpectedly (for a few weeks), so the team will be dividing her tasks among us. Next week we will further develop our Social Media and Outreach Plan. While Camilla is not with us physically, she is very much with us in spirit and continues to provide the inspiration for this project. We appreciated the opportunity to present to Luke Walter and the class on Tuesday evening, and took note of their feedback and suggestions. We gave further thought to the perceived optics of our group composition and the subject that our project is addressing. In light of these considerations, we changed the first word in the name of our project to more accurately convey our project’s focus. Thus the “R” in RAAD is now for Revealing rather than the prior “Reclaiming”, as in Revealing African Art Diaspora. As a non-tech person, it’s been rather astounding watching it all in action on the website and over on our slack channel. There are so many details it would have never occurred to me to consider, and it’s really impressive watching my teammates working through it smoothly and collaboratively. There’s been some really exciting back-and-forth that I mostly understand between Hannah on the design front and our CSS wrangler Rob. Everyone has been pitching in to get all the exhibits up, and Sabina had some really good ideas for making the website more navigable by content and tech interests. Everyone has been contributing promptly when needed. We introduced a new meme into our twitter rotation this week, and I continue to giggle no matter how many times I post them. Tweeting out the memes manually rather than using a bot has brought up some ethical questions to my mind about frequency of posting and who to target, which has been interesting to sit with and work through. I’m really excited about the exhibits that we have to share, and I can’t wait until they’re up so that you can all see them! It’s Brittany, back again with the latest updates on the Freedom Dreaming project. Here’s where we’re at. Phase 1 Website is here! : Our Phase 1 website is ready to go! You can access our Phase 1 website here: bit.ly/freedomdreaming We are continuing to update the website content. While we wanted to have a more finalized copy/design/website to begin with, as we’ve gone through this process we’ve sort of taken on the “building the boat as it’s sailing” attitude by addressing copy, design or submission issues as they come up. If you notice any glaring issues, please feel free to let us know. Ready for submissions! : We are interested in submissions! There are a few ways that people can submit. Individuals can go directly to the website and follow the instructions for submitting on that page or people can post their freedom dreams on their personal social media accounts (Instagram or Twitter), tag our social media accounts and use our hashtag #freedomdreaming. Please submit! It would help us out greatly if people from the class could get involved. We want to start sharing submissions on our social media to help generate more interest in the project. If you aren’t comfortable submitting publicly, our website allows for anonymous submissions. What we’re looking for in submissions: The goal of the Freedom Dreaming project is to visualize the future that we want to live in, and harness the necessary tools and resources to actively move that dream towards a reality. In order to imagine freedom, we are asking that individuals address specific inequalities that they experience within their lives in the form of I, (your name), imagine freedom as ______. An example would be “I, Brittany, imagine freedom as feeling safe while walking down the street, without being cat-called or harassed.” In this example, I am specifically addressing the gender inequality I experience when being in public spaces and allude to a future where I do not experience this gender-based street harassment. While we can’t control the submissions we receive, we are hoping that people engage with this project in the way that we’ve described above and avoid general submissions like “I imagine freedom as joy”. We want our participants to critically engage with systemic oppression on the individual level and highlight that oppression to help address inequality. I just realized I was supposed to post the group project update for last week (sorry team), so this is covering two weeks. Things are going swimmingly on Data TRIKE. We are busy, busy, busy. Last weekend Natasha, Nancy and I posted our narratives for the three initial data project exhibits that will be hosted on Data TRIKE, and we all plus Rob reviewed and gave feedback on each others’ work. There was an intense period of revisions and re-review. I think each piece is the stronger for it. Mine certainly is. We’re in a big push to finish getting content up on our site. Sabina and Rob are working on embedding the more complex supporting visuals for Nancy and Natasha’s pieces. I put my own content up, under Sabina’s expert guidance, because my visuals are all static images at the moment. Natasha and I both have supporting visuals made in Tableau, but it seems the WordPress install on the Commons may not allow embedding Tableau, so we’re using screenshots for now as a workaround. Still a little digging going on about that. We understand our website doesn’t have to be perfect before circulating the link, and it won’t be, but we need at least a first draft of content in there so that people have something meaningful to react to. We’re really excited to start sending it around and gathering feedback. Should be in that place by Tuesday. Natasha has continued our social media teaser campaign on Twitter, posting our data memes in response to tweets that reference “raw data” or “clean data”. It’s really amazing seeing all this hard work for the past 10(?) weeks coming together and our site getting built out. Next up we’ll be working on outreach language, contacting people on our outreach list (which we already have together) to solicit feedback, and maybe doing more with our Twitter feed (tbd). Hope everyone is enjoying the beautiful weather this Saturday. After weeks of work on Omeka and a realistic assessment of our dataset, we have decided to narrow our scope. We had hoped to be able to use ten percent of the records that we obtained or about 7,000 records. We realized that the task of cleaning and translating even seven thousand records (they were in French) was herculean and one we couldn’t accomplish in the amount of time left. We have decided to work with a much smaller dataset of 50 records and have that data as pristine as possible. We also discovered that creating a database in Omeka was a more complex task than first believed given the number of fields in each record and the limits of Omeka. We decided that the scope of the project would be limited to the documenting of our work with Omeka, the process of cleaning the data, and our attempts to create a functional database instead of the original proposal of a finished database with data visualization. We reassessed with the help of Andie Silva and Matt Gold. We decided that the entire process from the original scope to obtaining the records to the cleaning of the data to the reassessment should be documented for the benefit of others. If in the end, we only have a database (without the gallery portion) and a “white paper,” we have fulfilled the mission of the class as that is to work through the process of planning, designing, developing, and implementing a digital humanities project. In our limited scope, we will have completed those tasks to the degree which we were able. The project scope was large with seventy thousand records, an SQL backend, a gallery front-end, and a visualization of the data. We couldn’t account for the time that it took to develop the scope, get the data, learn Omeka (and Dublin Core), and Carto. All these aspects took longer than expected, and our estimates were off, but not for lack of trying. We ran out of time. Is that disappointing? In a word, yes. We had hoped to have a small version of a finished product as stated in our original scope. However, we can also acknowledge that in adjusting our ambitions, we have matured as individuals and as a group. It has been a great learning experience and one that is not only valuable to ourselves, but we hope in our documenting the experience, will be valuable to others.